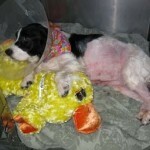 Molly, the Springer spaniel with a rare blood clotting problem, is doing better! It appears that her new treatment is working and if she continues to improve, she will be able to return to her dedicated and caring foster parents soon. Please continue to send healing thoughts her way. This entry was posted on Wednesday, April 7th, 2010 at 4:40 pm	and is filed under Dog rescue. You can follow any responses to this entry through the RSS 2.0 feed. Both comments and pings are currently closed.